When we decision where we want to spend the New Year, the only important thing was to go somewhere where is warmer. Not that we have any intention of sun, but the average temperature in Tel Aviv is 19 degrees for New Year’s holidays, is not bad. The flight takes an average of four hours, which is also fine. It is true that the Jews do not celebrate New Year’s Eve, but this is a city that by itself does not sleep – we’ll manage. I’m lucky to travel a lot, but I did not see any checks at Ben Gurion Airport in Tel Aviv. Passing through checkpoints million, million check to enter or exit from the airport. With a reason is one of the safest airports in the world. The important thing to emphasize is that you have to ask them that you do not “strike” stamp in the passport when entering their land and out of their country, but on paper that you keep in your passport while in Israel. There are many countries that do not want to let the passengers in your country if you have an Israel stamp in your passport. From the airport by train you can easily reach the city – in about 20 minutes. I knew from before that their soldiers – and boys and girls – you can see on the streets in full battle dress. Yes, we come from a country that the war was felt on their skin, but when you are sitting in a train next to you there is a group of soldiers and their automatic weapons hangs suspended as a school backpack and almost touch you, it’s not a nice feeling. However, after a while we are accustomed and more or less do not notice such things. We were placed in an apartment that is located right on the beach, we immediately rushed to walk the beach and take a picture next to the Mediterranean Sea. 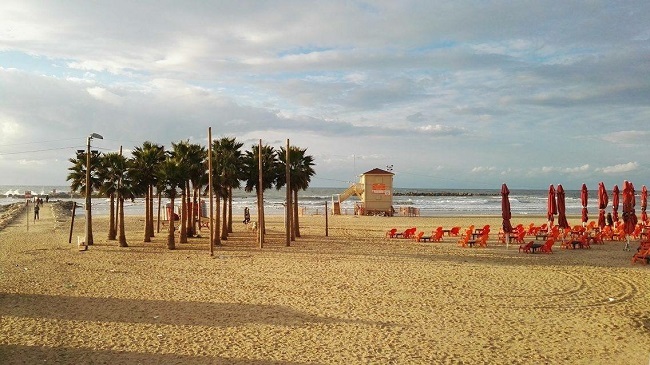 At the right end of the beach of Tel Aviv. Port is a modern, newly built, wide promenade, better restaurants and boutiques, and on the left side of the Jaffa – the oldest port in the world. There’s a reason this city called Miami Middle East. Many of the world’s hotel is located next to the beach, the promenade is full of color. The wind blew very hard, but we did not give up all 14 km, how long promenade which we walked and enjoyed. Wonderful sandy beaches, surfers waiting for a wave says, people walking and enjoying. Jaffa is part of the city that belongs to the Arabs, charming, beautiful city, with a viewpoint and a view of Tel Aviv. Old preserved buildings, narrow streets and the best pressed orange that I saw. Thick , almost sad cute but restores energy. Oranges from Jaffa are specific, have a thick crust and are known for their sweetness. When you walk a mileage like me that day, muscles are stretched and if you happen to want at all costs to take pictures while jumping from one of the walls of the fortress to create the best picture, then injury during knee and tendon and with great pain spend the rest of the holiday . Not to mention that I still feel the consequences. Learn from mistakes. One of the better meals we ate there near the Carmel market. Otherwise, one of the important things to trip us a tour of the local market and scoff at it with the local population. That was the case this time, a delicious meal with a lot of local spices, salads and spreads we were quite happy. The next day we visited the neighborhood Neve Tzedek, which is for me the most charming part of Tel Aviv. This is the first settlement outside the walls of Jaffa, which was formed when Jaffa too small for such a large number of Jews who came and settled in the Holy Land. The first settlement of modern Tel Aviv. There is an old train station, from which they made a great tourist zone. What I noticed in Tel Aviv and striking here is that people, and especially girls are not slaves to commercial brands, which are in large shopping centers, but their dress clothes designers, a little makeup and a very natural and relaxed. It should be noted that Tel Aviv is extremely expensive. For our tourists above average. The State of Israel has existed since 1948 and is one of the youngest states. 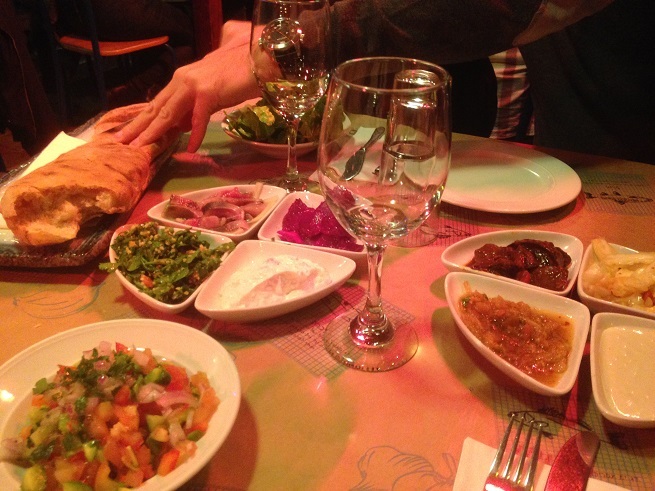 I was surprised when we were in a restaurant looking for something they, authentic, and received a response from the kind and the friendly waiter that Israel can only try something from the rest of the world, recipes and food that the Jews brought with them when they came to settle in Palestine. One thing you still can not see, and how is this city authentic and under the protection of UNESCO as a cultural heritage are the Bauhaus buildings, white houses that were built by Jewish architects here and which still has about 4,000. 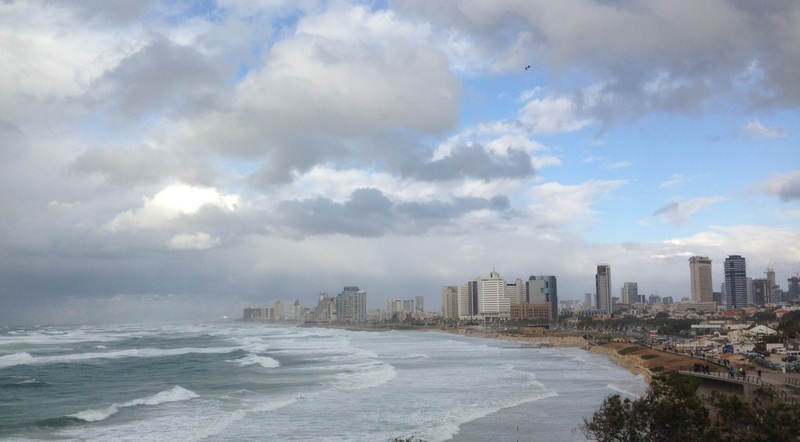 In Tel Aviv a lot to invest, according to quickly grow and build. New modern buildings and neighborhoods that you can see in the rest of the world are increasingly represented here. However, it still feels the spirit of the East and I hope it will remain so. The road to Jerusalem was more than strange. Distance between these two cities is about 70km, but out of Tel Aviv and entry into Jerusalem takes another hour certainly more than you planned. The bus station in Tel Aviv is something that can not be forgotten. A series of narrow corridors, with many bakeries, and all the little shop to the minimum 20 level. No way to first find your way around. It reminded me of Asia and their disorganization. 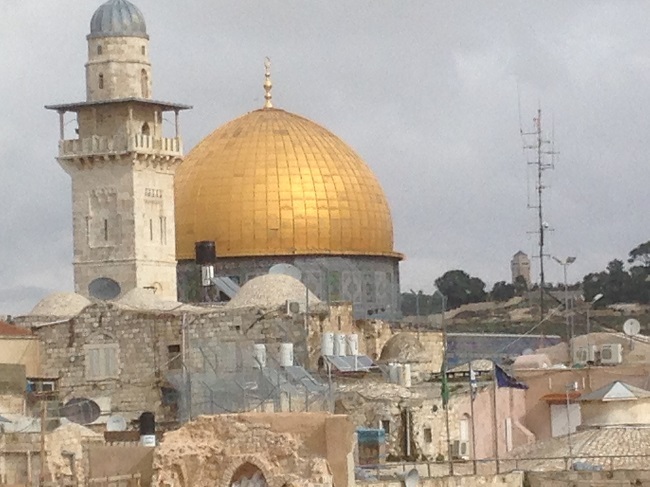 I mentioned that the Tel Aviv hellish expensive – Jerusalem about is ten times cheaper. Also, the temperature in Jerusalem is ten degrees lower than those in Tel Aviv. Every Friday from 17h to 17h Saturday is the Sabbath. Nothing works – shops, cafes, museums, transportation .. Therefore Jerusalem welcomed us full of rubbish and dirty on me, not just make a good first impression. The city itself is the beautiful white city in Jerusalem all the buildings and houses built of white, so-called Jerusalem stone. Construction Law in this way has existed since the reign of King David and respect. It’s full of parks, interesting installations in the streets. The main street ends on one side of the square through which the most famous is the work of Spanish architect Calatrava, and on the other it is coming to the old city of Jerusalem. Frankly, it is interesting to see and experience it, but I expected much more. We took a tour guide to us through the old town and today, in addition to historical facts, which certainly can be read in all the manuals, instructions and something that is not in books or on the net and the only locals know. When you are a believer, then for you this has a special significance, but certainly as anywhere in the world I want to all to meet and get all the information possible. The castle has been recently renovated and it looks like the old town of Budva. Exclusively and only subordinated to the tourists who flock headless. I was expecting a bit more spirit and sense of something sacred. 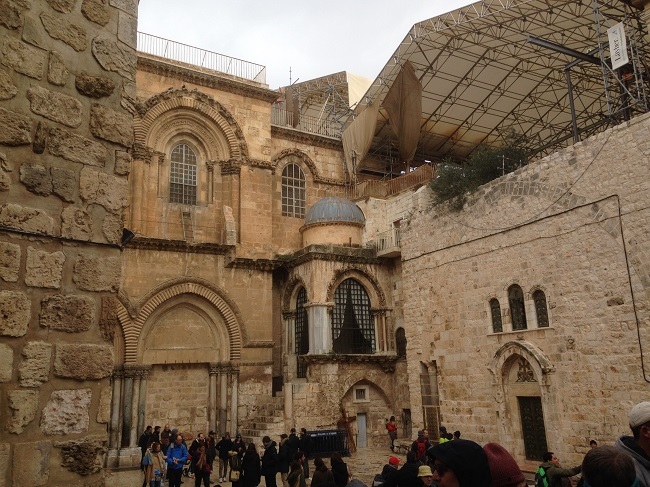 The old town is divided into four parts: the Jewish Quarter, Muslim, Armenian and Christian. Very soon it will be clear what part of the old city is located in the neighborhood where you are. The mosque Al-Aqsa you can not come when you want – there is no exact timetable when tourists are allowed to enter, it can also happen that a woman can not enter even when allowed to tourists. Western Wall, you can see a large number of Orthodox Jews in black robes and hats to pray. 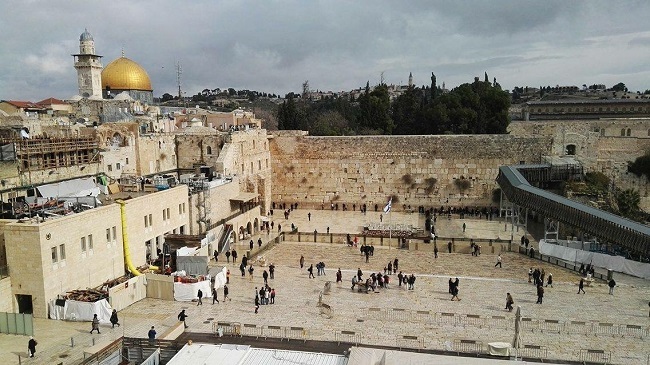 Otherwise, the wall is used to represent the extent to which the Jews were able to come and because they could not go to Olives mountains, they came to the wall and prayed, hence the name of the Wailing Wall. What struck me the strong impression is that I am in Jerusalem I saw a large number of people who look strange, but guide us to draw your attention to this because at some point in history were allowed to ask the other knee can marry to their community spread. I was not sure that this information is correct, so I call all the phone numbers of Jewish communities in Belgrade to verify this information, but unfortunately I did not get an answer. Also, the guide said that among the tourists who visit Jerusalem has the most Jews. A pleasant surprise was the Church of Christ’s rough . There is one place people pray six different denominations and Orthodox Christians, Roman Catholics, Armenians, Copts, Syrians and Ethiopians . Above the entrance to the church there is a ladder that indicate the status quo. Status quo determined that each faction has its own premises, but there are also common that everyone has the right to use. Also, everything is on the joint territory must remain so as long as we all agree on the change and even to the smallest details, such as scrolling candlesticks. Our guide explained that all the faith in the Old Town allow other religions to “make up stories” and is not a problem. So if Christians say that Jesus walked a certain street, so it was. If you Jews claim to be descended some stairs, everybody will confirm that is just what happened. Unfortunately we did not have enough time to see everything we imagined and everything this country has to offer so I look forward to returning next. Whether you are a believer, ordinary tourist or student of history, I believe you will find this extraordinary country and our warm and friendly people provide something just for you.